Shri Kushal Desai is an Administrative Advisor and Trustee of ISKCON Food Relief Foundation. He has a Bachelor of Science degree in Electrical Engineering from the Moore School of Electrical Engineering and a Business degree from the Wharton School, both of which are part of the University of Pennsylvania. Shri Desai was the Managing Director of GE Lighting in India. He has been associated with ELCOMA and IEEMA in various capacities in the past. He is the President of Dharmsinh Desai University, Nadiad and a Trustee on the Board of DDMM Heart Hospital, Nadiad (Gujarat) and The Lady Northcote Hindu Orphanage. Shri Desai is currently the Chairman & Managing Director of Apar Industries Ltd.
Shri Kunjan Gandhi is a Trustee of ISKCON Food Relief Foundation. He has completed his CA and ICWA and also done his Independent Director Studies (IDS) from S.P.Jain Institute of Management and Business Consultancy Studies Program by JBIMS. He is a Member of the Board of Directors of India Card Clothing Ltd. and Member of Taxation Committee of Bombay Chartered Accountants Society. He is a COO with World Tax Service India Pvt. Ltd., Mumbai, India which is a subsidiary of WTS AG, a German-based Tax and Finance Advisory Company and a Senior Partner with Thacker Butala Desai, Firm of Chartered Accountants. Shri Sanjay Tikku is the Program Director of Mid Day Meals – Delhi, Rajasthan and Jarkhand, Convenor of the Central Committee and Trustee of ISKCON Food Relief Foundation. He has done his B.Sc [Chem Hons] from Delhi University and his PG diploma in Interior Design from J&N. His entrepreneurial sprit led him to start a courier company and later an Interior Design organization with specialization in Exhibition design and event management, along with designing of commercial spaces, offices and Malls. He also started Imports of UPVC roofing Sheets from Malasiya and China for Marketing in India. Shri Rajendra Kumar Pujari is the Program Director of Mid Day Meals – Maharashtra and Trustee of ISKCON Food Relief Foundation. He has completed his B.E. (Mechanical). He has worked with Tube investments of India Ltd/Pennar Industries as Manager Marketing. Shri Rajendra Kumar Pujari is currently serving as the General Manager with Back to Godhead, India, a magazine of ISKCON and also serves as the Alternative Director of Back to Godhead Global magazine,e USA. Shri Rishi Kumara Das is a Trustee of ISKCON Food Relief Foundation. He has completed his BA from the Kerala University and MBA in Marketing & HR from Cochin University. 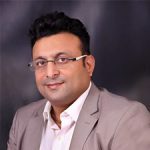 He has worked for nearly 13 years with the Indian Express Group, Hindustan Times Group and Express KCS an Indian MNC in various capacities in Strategic Planning, HR, Brand Management & Training in Senior Management positions. Shri Rishi Kumara Das joined ISKCON in 2010 and served initially as the Director of English Media. Currently, he is the Secretary for ISKCON Delhi Temple President & Temple Management Council & Vice-President for ISKCON Punjabi Bagh. Also the Legal Coordinator for ISKCON Vrindavan and ISKCON Delhi and co-ordinator for the ISKCON Seva Trust. He is actively involved in rolling out Reengineering Initiatives in Accounts and Cost Control for ISKCON Delhi and assisting the Bureau in initiatives as desired in Delhi-NCR and North India. Shri Sandeep Gupta is the Program Director of Mid Day Meals – Madhya Pradesh and Trustee of ISKCON Food Relief Foundation. He has completed his CA from Institute of Chartered Accountants of India, New Delhi and LLB from Ujjain University. He is a Partner with Sanjay B Gupta & Co. Chartered Accountants. He has vast knowledge in Financial Consultancy, Accounting, Auditing & Allied Activities. Entrepreneur with over 30 year of experience in managing high performance manufacturing units in both Automobile and Mega Kitchen environment. Have worked for automobile firms in Detroit, US and India. Apart from being a Mechanical Engineer and a Post Graduate in Operations Management, he is also a Six Six Sigma Master Black Belt trained from Texas, US. In 2004. He has renounced all material pursuits and used all of his professional knowledge and established Food Relief program – A Public-Private Partnership with Government of India for providing midday meal to the poor school children of India empowering the children and therefore eradicating Illiteracy and Malnutrition by bringing the truants and all school children to the schools. Shyamakanti Devi Dasi is the Chief of Quality in ISKCON Food Relief Foundation (Annamrita Foundation). She ensures calories, proteins, micronutrients quantity in the meal as well as tinkers the mundane recipe so as to make it interesting for the 2.5 lakh children every day. 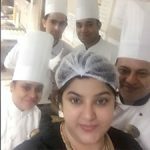 She is a Biochemistry Graduate from Kanpur University and also possesses Advanced Diploma in Food Technology from London. A Food Gourmet designer and a Food connoisseur de Haute cuisine, Shyamakanti Devi Dasi revamped Govindas – ISKCON Delhi and other similar projects from Aesthetics to its Menu-Spread. She conducted regular Food & Beverage workshops at ISKCON Delhi, the proceeds of which were used for the upkeep of the temple.